I'm a big advocate for military life. I know it's not for everyone, and I know it presents challenges that a lot of other couples won't have to face, but I am determined to showcase the good in it. Deployment stinks, separation stinks, but the lifestyle is one heck of a ride that I wouldn't change for anything. 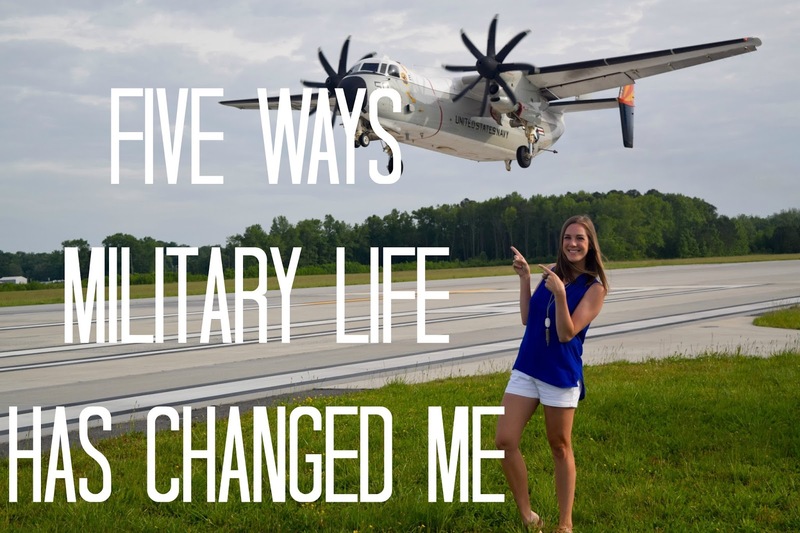 We've been on this military journey for 4.5 years now, so I thought it was time for some good old-fashioned reflection. I feel like I've learned more in the last 4.5 years about myself than I did in the 20 before. It sounds like a stretch, but military life forces you to fine tune qualities you didn't know you possess and learn an inner strength you may not have thought possible. I was a social kid in high school and college, but military life has taken that to a whole new level. I have the best friends both here in Virginia and spread throughout the world, and I seriously could not do this crazy life without them. Friends are your stronghold in this life. I'm sappier than a maple tree on a hot day. If I see a homecoming video or pictures of families being reunited after deployment, I melt into a puddle of butter. The USS Truman just returned home safely after an 8 month deployment, and seeing my friends reunited with their husbands brought me to tears! Miss Independent, party of me. I was fairly independent before, but that gets kicked up a notch when it's your job to run things by yourself while your husband is away. Military life will either bring out your independence or quickly help you gain it. I feel like the unpredictable schedules and the long months apart help me be more present in the moment. I feel like I appreciate the little things more, and I'm thankful for that. Complacency is always a fear of mine, and I think military life has taught me to value each moment for the special, unique thing it is. I don't think this last one really makes me a better person, but man it's the truth! Military lingo is like learning a new language. I'm only semi-fluent and will probably never be up to speed. I learn what a new word means and then hear five more I've never heard. It's a vicious cycle. I so agree! I'm learning to be more independent with Andy at work so much. And I'm *trying* to be more social. I have a "friend date" today with someone I don't know well and I'm so nervous! I thought dating was over after I met Andy! Yes to being more independent! I was that way before Kyle and I got married but the military takes it to a whole new level and I love it. I love that when he is gone I can still handle things and he doesn't have to worry about it. Oh my word, you are so right about the social part! Bailey just asked me the other day how I managed to gain so many friends in just this past year. I told her that I never used to be this sociable. The military really brings it out of you! That's one aspect of the military life that I'm especially thankful for. It has allowed me to adapt and make friends more easily.